The Ukrainian crisis began when pro-Russian president of Ukraine Viktor Yanukovych was deposed by the parliament on February 22, 2014 after months of partly violent protests against him. As a result of that sporadic clashes between pro-Russian rebels who mostly had supported president Yanukovych and the Ukrainian government troops on the other side occurred in Eastern and Southern Ukraine. In 2014 the Donetsk People's Republic and the Lugansk People's Republic declared their independence. Since then Ukraine tries to defend its territorial integrity by fighting these Russian-backed "republics". On March 17, 2014 the Crimean peninsula was invaded by Russia. In February 2015 unsuccessfully peace talks were held in Minsk, Belarus. Currently big cities like Donetsk, Lugansk, Horlivka, Makiivka or Debaltseve are under control of the pro-Russian rebels. August. Ukraine submits an application for observer status to in the Eurasian Economic Union. 23 October. NSA tapped the mobile phone of German Chancellor Angela Merkel. 27 October. Der Spiegel reports Obama personally approved wiretapping German Chancellor Angela Merkel's cell phone conversations. October. Jeff Bezos, founder of Amazon.com purchases the Washington Post for less than half of his ongoing contract for cloud service with the CIA. The Institute for Public Accuracy releases a statement condemning the move. Washington Post begins promoting Hillary Clinton as their preferred candidate for President in 2016. The NATO organization was founded on the solitary premise of collective security to contain Soviet expansion in Europe. With the collapse of the Soviet Union in 1992, many questioned the need for it's continued existence against an enemy that no longer existed. Several former Soviet satellite states (East Germany, Poland, Hungary, Romania, the Czech and Slovak Republics) as well as newly independent former Soviet Republics (Latvia, Lithuania, Estonia, Georgia and Ukraine) wanted EU membership, which of coarse would ultimately mean NATO membership, as well (military alliances exist to protect economic alliances). Russia under Boris Yeltsin wanted EU and NATO membership. The NATO powers that be made clear they had no interest in going out of business, and Russia argued how unfair it was that they should dissolve their defense alliance (the Warsaw Pact) and be thrust into another arms race against a growing NATO, which was swallowing up many of Russia's former military allies. But the case of Ukraine was unique. Ukrainian nationalists wanted out of the Russian orbit. 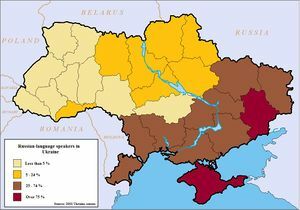 But some the territories of Ukraine are inhabitted by a significant majority of ethnic Russians, too, who wanted to maintain close ties to Russia. The official US State Department's position under President George Herbert Walker Bush at the time was that the Ukraine should remain a sovereign republic within the Russian Federation. Bush argued as much in a speech written by Condoleezza Rice to the Ukrainian parliament. But the Clinton's took over in early 1993, and caved in to Ukrainian nationalists. In exchange for US recognition of a Ukraine independent of the Russian Federation, Ukraine would give up its nuclear stockpile from the Soviet era, and the US would guarantee Ukraine's security, should the Russians ever invade. The agreement reeked a lot like the assurances Great Britain and France gave Poland at the Treaty of Versailles in 1919 that bound them to war with Hitler in 1939 when Hitler invaded Poland. Like the Treaty of Versailles, the 1994 Budapest Memorandum on Security Assurances negotiated by Bill Clinton lasted exactly 20 years. Unlike Great Britain and France who went to war with Nazi Germany when the agreement was violated, Barack Obama broke the pledge that Clinton had committed the United States to. US/Russian relations have deteriorated ever since. And converting NATO from a purely defensive alliance based on the idea of collective security to a military machine waging aggressive wars - as it had done in Libya - fulfilled many people's worst nightmare. No longer can negotiation and diplomacy be used to keep the peace, as the Obama administration had thrown American promises on the dunghill. Gaddafi ceased terrorism, gave up his WMD, and became an ally, all predicated on accepting American promises, only to be brutally murdered at the hands of Hillary Rodham Clinton and NATO. Ukraine had given up its Soviet-era nuclear stockpile based on assurancess given by Bill Clinton, ignored by Barack Obama. Military force now is the only option remaining to remove nuclear weapons from the hands of Kim Jong-il. Since the Battle of Stalingrad in 1942 it should be clear to anyone, Russia will never allow an aggressive and hostile military force, such as NATO transformed itself into in the Obama era, to ally itself or encamp within the Ukraine. Edward Snowden warned of such abuse played out in 2016 and 2017: an Executive branch with unlimited. unrestrained power to spy on investigative Committees of Congress, political opponents, and even the Supreme Court. 20 November. UK government struck a secret deal with the NSA to share phone, internet, and email records of UK citizens. ABC News reports on terror suspects arrested in Bowling Green, KY.
21 November. Democratically elected government of the Ukraine rejects European Union association agreement in favor of maintaining relations with the Eurasian Economic Union (EAEU). The path to securing a NATO naval base in Sevastopol on the Black Sea is effectively cut off. Soros-sponsored Euromaiden riots erupt. 22 November. NSA strategy document reveals the agency's goal to acquire data from "anyone, anytime, anywhere" and expand its already broad legal powers. At least 6.7 million refugees and migrants, predominantly male from all over the Islamic world have since invaded Europe, coming through Libya and Syria. The government of Sweden stopped issuing crime statistics in 2014 when it was reported that murders committed by refugees and migrants occurred at a rate 400% greater than native Swedes, and rapes committed by foreign migrants 550% greater. On 1 January, 15,000 held a torchlight march through Kiev in support of the 105th birthday of Stepan Bandera, a controversial World War II-era nationalist. Protesters carry the black and red "blood and soil" flag of the Ukrainian Insurgent Army. Leafets with instructions handed out to Soros-backed terrorists in Euromaiden Square, Kiev were identical to those handed out in Tahrir Square, Cairo three years earlier. On the left printed in Arabic, on the right in the Ukrainian language. 117 people were killed by Obama and Soros' terrorists. On January 28, Victoria Nuland and US ambassador to Ukraine, Geoffrey Pyatt discuss details of planned overthrow of the democratically elected government of Ukraine. Nuland makes disparaging remarks about the EU, and thinks the UN will give better cover to make the new US-installed regime appear legitimate. On February 6, 2014 Assistant Secretary of State Victoria Nuland meets with Oleh Tyahnybok and other ringleaders who assume power after the coup. Tyahnybok leads the Svoboda party. Tyahnybok in 2004 was kicked out of the ruling parliamentary faction after giving a speech calling for a fight against the "Muscovite-Jewish mafia." In 2005 Tyshnbok signed an open letter to Ukrainian leaders calling for the government to halt the "criminal activities" of "organised Jewry", which was spreading its influence through organisations such as the Anti-Defamation League which ultimately wanted to commit "genocide" against the Ukrainian people. DCLeaks published Soros emails arranging a meeting between George Soros and Tyahnbok. Soros, an 84 year old veteran of the Nazi-era Judenrät in Budapest who survived World War II and parlayed his pilfering Holocaust victims' property into a $25 billion personal fortune, himself is Jewish, a proud atheist, and vehement anti-Zionist. Various Soros' international progressive and liberal front organizations (NGOs) organized and funded the Ukrainian coup. Obama foreign policy shifted at this point forward from the "Russian Reset" of 2008 and the greater "flexibility" Obama promised President Medvedev in 2012, to rabid Russophobia, one factor being Vladimir Putin's lack of support for the homosexual agenda and gay marriage. The anti-Russian grip of Soros on American foreign policy reaches a fever pitch in in coming years in efforts to destroy President Donald Trump who sought to mend relations with Russia after the Ukrainian coup crisis. On February 7, 2014 NBC reported UK's GCHQ used "dirty tricks" such as computer viruses and sexual "honey traps" to target adversaries (see 27 October 2009). On 18 February the NSA and UK's GCHQ reportedly monitored traffic to the WikiLeaks website and considered a move to monitor communications going to or from WikiLeaks and the Pirate Bay. Protesters at the CIA backed neo-Nazi Euromaiden torchlight march carry the "Blood and Soil" flag of the anti-government Ukrainian Insurgent Army. Between 18–20 February the Ukrainian coup begins in which almost 100 Soros-backed activists and 17 police officers were killed. As in Syria and other "Arab Spring" uprisings, agent provacateurs begin shooting and killing people on both sides to provoke a civil insurrection. In February 2014, Russian soldiers landed in Crimea. Because some of the people currently living in Crimea are ethinic Russians, there is a dispute whether Crimea belongs to Ukraine or to Russia. On March 11, 2014, Crimea declared its indepence from Ukraine. On March 16, 2014, Russia sponsored a referendum in Crimea about joining Russia. The United States and the European Union called the referendum "illegal". Because the referendum gave voters only two choices: join Russia now or later, experts already declared that most Crimeans will vote for the connection to Russia. As a result of it 95.5% of voters supported joining Russia. Since March 18, 2014, Russia claims Crimea as a part of its territory. Only Afghanistan, Cuba, Nicaragua, North Korea, Russia, Syria and Venezuela recognize Crimea as a part of Russia. On March 27, the U.N. General Assembly passed a non-binding resolution (100 in favor, 11 against and 58 abstentions) declaring Crimea's referendum invalid. In response, the United States and Europe have imposed sanctions against Russian trade. In February 2017 President Trump accused Russia of taking Crimea by force and asked whether Obama was too soft on Russia. On 24 February the UK's GCHQ conducts covert operations to disrupt and shape online discourse. On 28 Februar the UK's GCHQ, using a program called Optic Nerve, intercepted and stored webcam images from millions of Yahoo users, then passed them on to the NSA's XKeyscore database. 11 March. Senate Democrat Intelligence Committee Chair Diane Feinstein takes to the Senate floor to accuse the Obama CIA of violating "the Fourth Amendment, the Computer Fraud and Abuse Act, as well as Executive Order 12333, which prohibits the C.I.A. from conducting domestic searches or surveillance," and "breaching a constitutional boundary" of intimidation and spying on the US Senate. 13 March. Document reveals that, while many foreign governments share information with NSA, few senior officials outside of the intelligence or defense sphere have any knowledge of it. 20 March. Majority Leader Harry Reid backs investigation into Obama CIA hacking of the Senate Intelligence Oversight Committee's computers, and notifies Brennan and Attn. Gen. Eric Holder that the Capital Police will investigate charges that the CIA accessed the Intelligence Oversight Committee’s computer network. On April 16, 3014 Forbes reported CIA Dir. John Brennan's visit to Ukraine. On May 2 pro-Russian extremists killed two pro-Ukrainian activists. Shortly afterwards Ukrainian nationalists murdered at least 42 Ukrainians are  most burnt alive in the Odessa Trades Union Building. The bodies were removed and buried in secret. Survivors of the fire inside the building were executed with bullets to the head. Some were beaten to death with clubs when they jumped from Windows of the burning building. A pregnant woman was strangled. In July 2014 a Malaysia Airlines plane was shot down in Eastern Ukraine. A report by the Dutch-led Joint Investigation Team proved that the plane was “shot down by a 9M38 missile launched by a Buk, brought in from the territory of the Russian Federation, and that after launch was subsequently returned to the Russian Federation”. On July 31 Democratic Sen. Mark Udall calls for Director Brennan's resignation. Instead, on 7 August DIA Director Gen. Michael T. Flynn was fired. On 19 December George Friedman, chairman of Stratfor, calls Ukrainian coup "the most blatant coup in history." 28 January. Sens. McCain and Cardin introduce the Global Magnitsky Act. Under this bill, the inability of NATO to form a consensus and act, or the US Congress and public opinion to oppose certain regimes and actors is compensated for by granting the president power to impose sanctions against persons anywhere in the world at his discretion. 2 March. Katherine Herrige of FOX News reports Obama administration senior intelligence officials told her Abdelhakim Belhadj is firmly aligned with ISIS and supports Islamic State training camps in eastern Libya. "Critics say Libya's new position as a safe haven for ISIS reflects one of the most significant policy failures of the so-called Arab Spring," Herrige said. Herridge added that counter-terrorism sources have confirmed that the new support base for ISIS in eastern Libya is now providing "tangible assistance" in the form of training camps around the city of Derna, in addition to a growing number of Libyan fighters joining the terror group in Syria and Iraq. 6 March. German government expresses concern over Obama warhawks aggressive stance toward resolving crisis in Eastern Ukraine, accuse Obama's NATO commander of using false data to inflate and exaggerate size of "Russian threat". 18 September. United Nation's Office of the High Commissioner on Human Rights condemns cover-up of the mass murder of 48 Ukrainians at the Odessa Union Trades Building (see 2 May 2014). 21 October. Wikileaks reveals John Brennan also used private email server. 15 February. President Trump accused Russia of taking Crimea by force and asked whether Obama was too soft on Russia. 20 June. President Trump meets with Ukrainian President Petro Poroshenko, the U.S. Treasury Department imposed sanctions on 38 Russian individuals and entities involved in the conflict with Ukraine. 21 December. The Trump administration approved the export of lethal small arms to Ukraine, including a multimillion-dollar sniper rifle deal – something the Obama Administration refused to do – ramping up its support for the country in the simmering conflict with Russia-backed separatists. ↑ 80% of asylum applicants between the ages of 14 and 34 were male, which Eurostat describes as "gender inequality." Asylum statistics, Eurostat Statistics Explained, Data extracted 2 March 2016 and 20 April 2016. ↑ "Ukraine right revives wartime symbols amid 'revolution'", 3 January 2014. ↑ "Ukraine's far-right Svoboda party hold torch-lit Kiev march", BBC News, 1 January 2014. ↑ "U.N. General Assembly declares Crimea secession vote invalid", Mar 27, 2014. ↑ "U.N. General Assembly resolution calls Crimean referendum invalid", March 27, 2014. ↑ "Backing Ukraine’s territorial integrity, UN Assembly declares Crimea referendum invalid", 27 March 2014. ↑ "UN General Assembly approves referendum calling Russia annexation of Crimea illegal", March 27, 2014. ↑ "Ukraine: UN condemns Crimea vote as IMF and US back loans", BBC. ↑ Dearden, Lizzie (September 28, 2016). MH17 shot down by rebels with missile from Russia, say investigators. Independent. Retrieved September 19, 2018. ↑ Donald Trump accuses Russia of taking Crimea by force in attempt to distance himself from campaign allegations. Independent. Retrieved September 19, 2018. US Expands Sanctions Against Russia, Ukraine Separatists. Voice of America. June 20, 2017. Retrieved June 26, 2017. Treasury moves to 'pressure' Russia with new sanctions in Ukraine conflict. Fox News. June 20, 2017. Retrieved June 26, 2017. Gehrke, Joel (June 20, 2017). Trump hits Russia, Ukrainian separatists with sanctions. Washington Examiner. Retrieved June 26, 2017. Jackson, David (June 20, 2017). Trump meets Ukraine president as Treasury Department sanctions Russia. USA Today. Retrieved June 26, 2017. Betz, Bradford (December 21, 2017). Trump administration OKs sale of lethal arms to Ukraine. Fox News. Retrieved February 2, 2018. Lederman, Josh (December 23, 2017). US agrees to send lethal weapons to Ukraine, angering Russia. Associated Press. Retrieved February 2, 2018. U.S. approves license for Ukraine to buy small arms from U.S. firms. Reuters. December 20, 2017. Retrieved February 2, 2018. Wong, Kristina (December 20, 2017). Trump Approves Lethal Arms Sales to Ukraine, Reversing Obama-Era Inaction. Breitbart News. Retrieved February 2, 2018. Mora, Edwin (December 22, 2018). Trump Approves Private Sector Arms Sale to Ukraine to Fight Russian-Backed Troops. Breitbart News. Retrieved February 2, 2018. Luhn, Alec (December 21, 2017). Donald Trump approves deal for US to sell sniper rifles to Ukraine, angering Russia. The Telegraph. Retrieved February 2, 2018. Peterson, Nolan (December 21, 2017). Trump Approves US Lethal Weapons Sales to Ukraine, Angering Moscow. The Daily Signal. Retrieved February 2, 2018. This page was last modified on 9 April 2019, at 18:36. This page has been accessed 9,359 times.